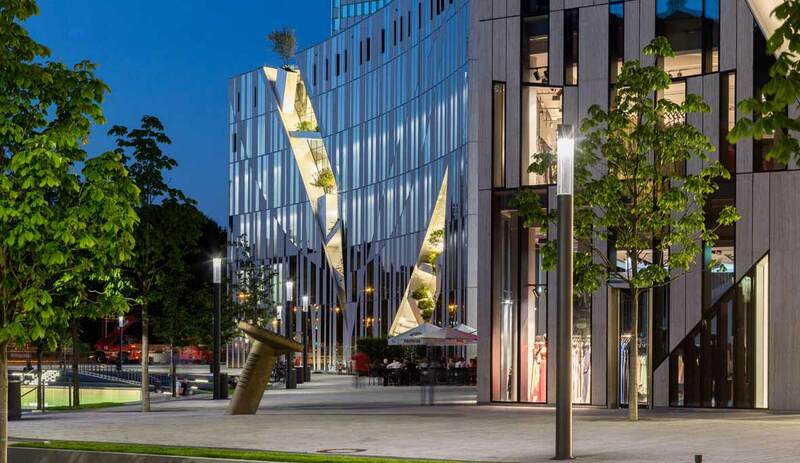 Any casual stroll along the world-famous Königsallee now ends in front of the imposing Kö-Bogen facade constructed of glass and natural white stone, designed by the renowned architect Daniel Libeskind. The construction represents the northern endpoint of the magnificent boulevard and is a two-part building accommodating flagship stores, restaurants and office spaces distributed across 9,000 square metres. 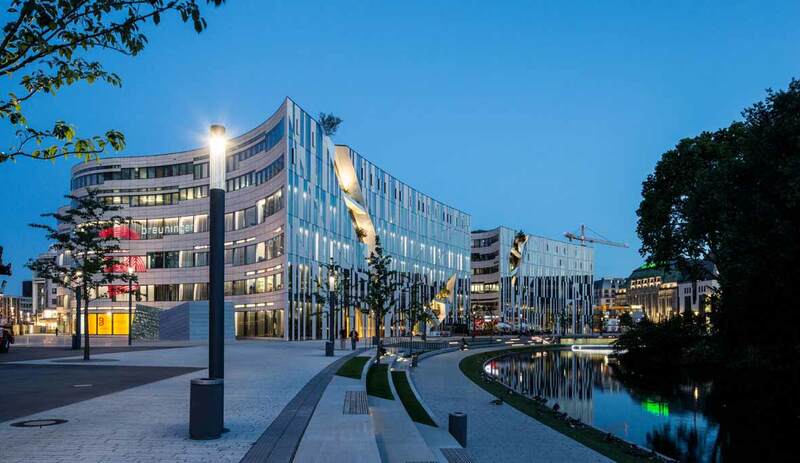 The landscape architects from FSWLA GmbH and the Düsseldorf municipal planners focused on a high quality of stay for the open areas, and paths directly adjacent to water, the integration of the Hofgarten and floating gardens within the building facade are just a few examples of this. The urban jewel is compellingly complemented by the purist TRILUX light column concept. special atmosphere. In addition to their purist appearances the luminaires also feature further appealing benefits. Thanks to Multi-Lens Technology the location adjacent to the water is illuminated in highly uniform but glare-free light. Security aspects are fulfilled due to standard-compliant specifications and levels of energy efficiency are also impressive, because in comparison to conventional outdoor lighting the ConStela LED consumes 40% less energy. Together with a long service life and simple maintenance, the system is also compelling in terms of sustainability. Passers-by wishing to go from the column-bordered water bank to the other side of the water take the fenestrated Landskronenbrücke bridge. Countless LEDs integrated into the balustrades create highly attractive illumination in darkness, with the bridge representing a discreet visual transition between the Kö-Bogen and the green of the Hofgarten. 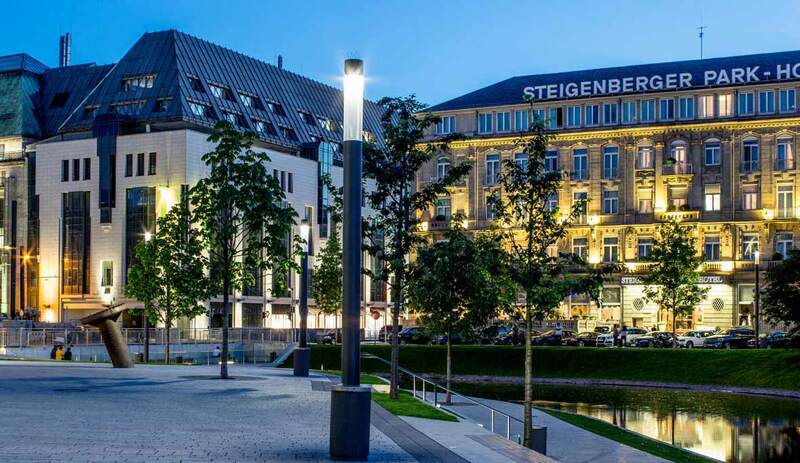 With its lighting design for the Kö-Bogen TRILUX has aided in giving the world-famous Königsallee an architecturally successful finish, and the ConStela LED in both form and function provides a considerable contribution.